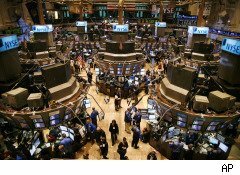 Stocks rebounded in late trading Monday as investors shrugged off concerns about a Fed meeting on interest rates and declining oil prices. The Dow ended up 17.46 points to finish at 10,642.15. The S&P500, which peaked last week at a 17-month high, closed up a half-point at 1,150.51. The NASDAQ declined 0.23% to 2,362.21. Financial stocks were the most active, as details emerged from Senate Banking Chairman Christopher Dodd's bill to overhaul financial sector rules and regulations. Energy stocks slumped as the oil prices fell under $80 a barrel. Boston Scientific (BSX) fell 12%, or 98 cents, on news that the medical device company halted shipments and recalled its heart defibrillators after the company said it failed to inform the FDA about manufacturing changes. Gramercy Capital (GKK) plunged 40% or $1.70 a share after the commercial real estate finance company reported lackluster a drop in fourth quarter earnings. Consol Energy (CNX) dropped or $4.25 increase following news that it will acquire Dominion Resources's (D) natural-gas business for $3.48 billion. PepsiCo (PEP) gained 1.5% or $1.03 after it announced it would be offering shareholders dividends and buying back stock to increase the stock's value. Wal-mart (WMT) gained nearly 3% or $1.52 after analysts increased the company's rating and price target based on the grocery-chain's likelihood to lower food prices. Phillips-Van Heusen (PVH) gained 10% or $4.66 after the announcement that it agreed to buy clothing maker Tommy Hilfiger from private- equity firm Apax Partners in a $3 billion deal. Quiksilver (ZQK) stock jumped 12% or 50 cents after the surf-inspired clothing-maker reported solid first quarter earnings. Baidu (BIDU) gained nearly 5% or $26.46 cents on news that Google may discontinue its operations in China, eliminating a primary competitor for China's Internet search engine. Citigroup (C) slipped 2% or 8 cents a share with heavy volume as details of a banking reform bill reverberated through financial stocks. Bank of America (BAC) was unchanged with heavy volume as details of a banking reform bill reverberated through financial stocks.